KUIU recently released their Ultra NX Raingear to specifically reduce weight for hunters who rely upon keeping their pack and gear as light as possible. Featuring a 30 denier nylon face fabric, the Ultra NX was not designed to be worn regularly while busting through wet brush, but should be utilized primarily when waiting out sudden storms. With the jacket weighing in at a mere 8.9 oz and the pants 7.5 oz this combination is not only super light but packs very small. Extremely breathable, the Ultra NX may be minimal on features as it has no pockets but displays a well-designed hood, wrist and waist closure adjustments. Ultra NX is very quiet and is designed so that you can wear it over your jacket and pants. 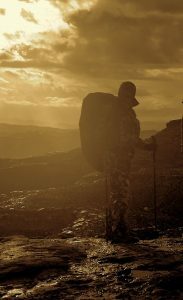 The basic facts are that KUIU’s Ultra NX Rain Gear is extremely lightweight and was designed for Mountain Hunters who must reduce ounces so that they can move faster and further out on the mountain. It’s amazing, but when combined, the Ultra NX Rain Jacket and Pant together weigh less than the average bivy sack. The Ultra NX Rain Jacket compresses down to practically nothing in your backpack and that translates into more space and less weight on your back. No extra frills with the Ultra NX as all pocketing has been removed with a more streamlined waist and hood drawcord system compared to the other KUIU raingear lines. This is the ultimate lightweight rain jacket that provides the protection you need when unexpected storms strike! Importantly, the Ultra NX is fully seamed taped, features anatomical shaping, a laminated drop back hem and storm hood with 2-direction adjustment. With quality raingear, it is critical that the material is breathable or you will feel like you are inside a sauna. Utilizing Toray’s remarkable Dermizax NX waterproof breathable membrane, (the industries leading waterproof breathable membrane with a rating of up to 50,000g/m2/24h/40,000mm) KUIU’s Ultra NX doesn’t trap moisture inside your raingear. Toray’s Dermizax®NX has undoubtedly established a new standard for waterproof breathable membranes. This membrane is completely wind and waterproof. The feature that I find most amazing is that this material also provides 200% stretch in all directions. The Dermizax®NX laminate is manufactured completely in Japan and undergoes strict production and quality controls. Dermizax®laminates are non-porous PU membranes, which are developed on a molecular level to create Dermizax®NX. Now the bonds of hydrophilic PU molecules can be controlled exactly and arranged in structures that strengthens the diffusion of water vapor molecules, increases that transmission rate and leads to higher respiratory activity. This makes the Dermizax®NX the perfect membrane for waterproof breathable gear. KUIU understands very well that hunting in today’s world is “high tech” and they are leading the way! This raingear is perfect for backpack hunters who will be spending multiple days on the mountain and are continually on the move where packing less weight is critical. Ultra NX allows us as hunters to wear a Waterproof, Breathable garment in a wider range of conditions while eliminating unnecessary bulk and weight. We now can carry lighter loads and yet still meet the critical needs of a safe and effective waterproof layering system. If you will be doing a lot of glassing and will not be busting through wet brush then the Ultra NX is a perfect choice. Although I live in a relatively dry state I can honestly tell you that there have been days out on the mountain when it was absolutely essential that I was carrying a breathable, high quality, lightweight pair of raingear capable of not only keeping me dry in some unbelievable fierce thunderstorms but that would also protect me from the cold, bitter winds that can make life miserable! 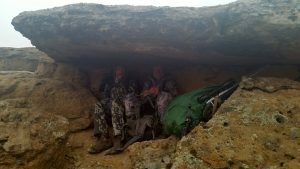 As a guide/hunter, having the ability to stay dry is critical to my safety. Raingear is a very important item of gear to every Mountain Hunter’s safety because if we get wet in cold weather it can quickly lead to hypothermia and that very dangerous condition is not something that any of us want to have to deal with when chasing trophy animals. Some of the issues I have had with different raingear in the past is that they were noisy, were not flexible nor conducive to me moving freely, was way too heavy and they drenched me with sweat from the heat created because the old raingear did not breath well. There lay the two-edged sword; if I didn’t wear the raingear I got soaked and cold from the rain/snow which was dangerous and yet I still got wet from the internal perspiration and heat when I did wear it. 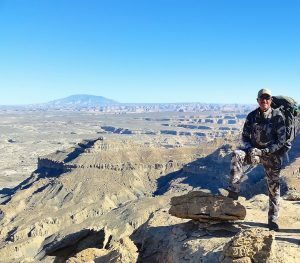 I knew that when KUIU released their “game changing” Ultra NX ultralight raingear featuring Toray’s waterproof, breathable Dermizax®laminates that I had found the perfect gear for my backpack hunting adventures. Because of the weight, I can keep both the Ultra NX Jacket and Pant in my pack where they are immediately available to pull out when inclement weather strikes. Very packable, I have used my Ultra NX raingear extensively this past fall and during the early winter months. I’m always cognizant of the weight I carry because it is critical that I can cover a lot of country to access key glassing points. With the Ultra NX’s two-way full leg zippers, 2-way stretch and anatomical shaping for comfort I can slip into this raingear within a minute and I’m prepared to weather out very wet conditions. With the Ultra NX being lightweight I don’t use this raingear to break through heavy wet brush but use it to stay dry while glassing, or when I am in desert terrain free of thick undergrowth where durability and weight are not an issue. I can honestly say that my Ultra NX raingear has performed extremely well for me in the high desert terrain that I spend most of my time in. I’ve been extremely impressed with its breathability. The two-way stretch, 3-layer construction has allowed me to hike comfortably and freely. This raingear is just what I’ve been searching and dreaming for. It is absolutely great. 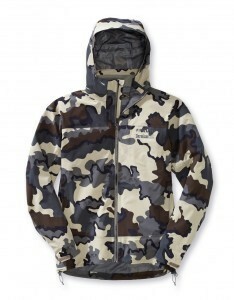 The Ultra NX raingear is not as tough nor as durable as my KUIU Chugach NX raingear but that is not its forte. The Ultra NX’s strength is its weight. If I was going to be in extremely wet, cold conditions in thick, heavy undergrowth such as are found on certain hunts in Alaska then I would look for durability. However, when I encountered a very cold, dangerous and wet fall storm far out on a high desert plateau while guiding a desert sheep hunt this fall I didn’t hesitate to reach into my backpack for this lightweight, waterproof, and very packable item of raingear. Within a minute I had the pants and jacket on. With the two-way zippers on the pants that extend all the way up to your thighs I was able to get the raingear on over my boots without sitting down and pulling “for all I was worth.” To save weight this raingear doesn’t feature pockets, which is not a problem for me. With the Ultra NX zipper system I easily have the ability to access the pockets of the pants I’m wearing underneath the raingear without having to pull my raingear down. The two way stretch material and flex drawstring allows me to easily go to the bathroom without having to pull my raingear clear down which was a problem with other raingear. I highly recommend the purchase of KUIU’s Ultra NX lightweight raingear for hunting conditions where you will not be doing a lot of bush whacking. This is a high quality; critical item of gear and you can expect the best in innovative fabrics as well as results. The Jacket and Pant will run $299.99 and $249.99 respectively and are well worth the price if you demand the best in your gear. 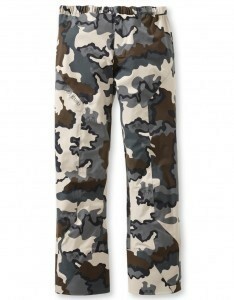 They can be purchased in either KUIU’s trademark Visa or Verde Camo patterns. With the purchase of KUIU’s high quality raingear, you should expect it to not only perform but provide you with years of quality use. You should also have high expectations of quality Customer Service that I have found KUIU to offer. I’ve not been disappointed for a minute in this important investment. I have a lot of raingear but my KUIU Ultra NX is the raingear that I reach for on my extended backpack trips knowing that I can count on it to keep me dry when an unexpected thunderstorm pops up. For the specific conditions that KUIU’s Ultra NX raingear has been made for I can’t find any fault with the design or material. The ultralight construction and Toray’s remarkable Dermizax NX waterproof breathable membrane, has met my expectations. Keep up the great work Jason and KUIU. As always, I appreciate your vision and the fact that you listen to your customers, the Mountain Hunting community! excellent rain gear, because of its very light weight i carry this gear with me more than any other. i live in wyoming where we do not get a lot of rain, but i always like to be prepared. i do not use it a lot but when it is needed it is essential. it works great. well worth it.